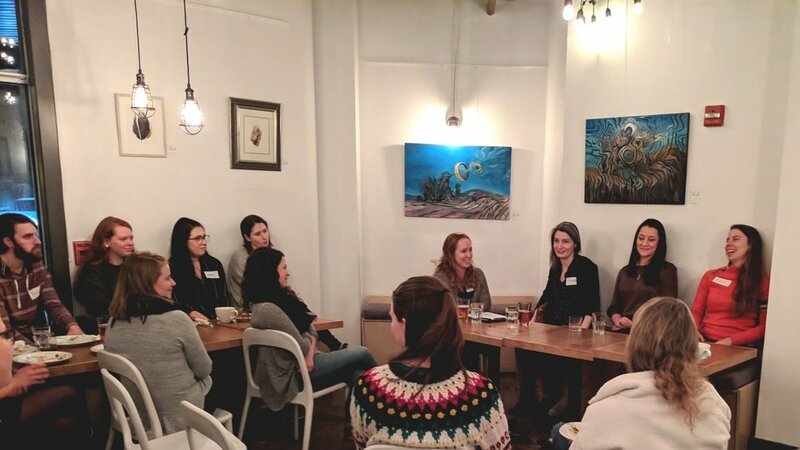 For this semester’s Women in STEM initiative, we reached out to three women who hold graduate degrees and have gone on to pursue careers in consulting and government. We invited ASPIRE trainees and professors, as well as other grad students with an interest in the topic, to join us for a panel discussion. Questions were sent in beforehand, and topics included transitioning from academia to their current work, satisfaction of their scientific curiosity, paths to employment, and the importance of mentorship in guiding each of their careers. Elizabeth Kennedy, P. Geo., M.Sc. The panelists discussed how different their current work is from their work in grad school. All panelists were in agreement that the skills they gained in graduate school equipped them for learning quickly how to turn projects around in non-academic environments. This skill of learning on the fly is crucial in work life; those research skills can be used to turn unfamiliar words into familiar concepts. It is important to learn from the experience you gain and use it as a first step to further your careers. One attendee asked, “do you find your current job satisfies your scientific curiosity?” The panelists responded that it has been exciting to move from an academic to a non-academic environment, insisting that if you do things right, you will never stop learning. From new technical terms to new points of view on familiar topics, there is sometimes not enough time in the day to find answers to all of your questions. To that end, your curiosity may never actually be satisfied, but the pursuit of the answers is very satisfying. Additionally, they note that the scope of your work may change dramatically every several months or few years as new projects start and are completed, and there are many ways to pursue interesting research questions at work (for example, through collaboration with groups such as the ASPIRE program). We sometimes hear anecdotes about people with Masters and especially Doctoral degrees being dismissed as overqualified for a job. However, our panelists see graduate degrees as entry points to certain areas of government and consulting. They advised students to focus on how your degree makes you adaptable; you must demonstrate that you are interested in more than your research topic - you have to wrap up all of your skills, technical and non-technical, into a package that shows that you are nimble enough to apply your curiosity to other subjects. ASPIRE trainees are encouraged to pursue professional designation (if they are eligible) to round out their professional toolkits. One of the facets of registering with a professional organization is a formalized mentor program, but the panelists credited numerous informal mentors who helped them to arrive where they are today. Sometimes a mentor is someone who in the right place at the right time, and sometimes mentorship is a variety of people who inspire you over the course of your career. Students were advised to be aware of the power of the people around them, and to nurture any interest a potential mentor may have in them. After the talk, there were many more questions and conversations as guests clustered together and shared stories and suggestions for career direction. Thank you to our panelists and to everyone who came to listen and ask insightful questions! We were pleased to host this event at The Nook, which not only provided us with a beautiful space, but also put together delicious food for our group. This initiative is funded by the Natural Sciences and Engineering Research Council of Canada (NSERC) and is a Collaborative Research and Training Experience (CREATE) graduate training program.